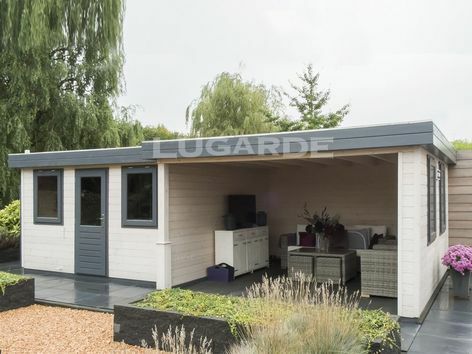 The Lugarde Prima Erin is a handy sized summerhouse with door and two windows plus a flat roof square canopy enclosed on three sides with windows in the side wall for extra light. 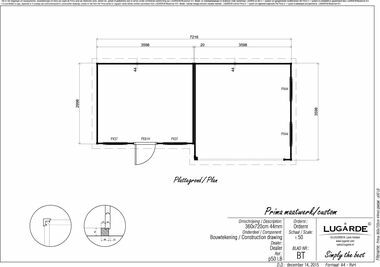 Overall summerhouse size 7.2m x 3.6m in 44 mm log thickness. The standard package includes 1 x PE61H single door, 2 x PX37 windows and 2 x PX44 windows. The canopy measures 3.6m x 3.6m and the cabin 3.6m x 3m.